A local storage domain can be set up on a host. When you set up a host to use local storage, the host automatically gets added to a new data center and cluster that no other hosts can be added to. Multiple host clusters require that all hosts have access to all storage domains, which is not possible with local storage. Virtual machines created in a single host cluster cannot be migrated, fenced or scheduled. For more information on the required system users and groups see Appendix G, System Accounts. On Red Hat Enterprise Virtualization Hypervisors the only path permitted for use as local storage is /data/images. This directory already exists with the correct permissions on Hypervisor installations. The steps in this procedure are only required when preparing local storage on Red Hat Enterprise Linux virtualization hosts. On the virtualization host, create the directory to be used for the local storage. Ensure that the directory has permissions allowing read/write access to the vdsm user (UID 36) and kvm group (GID 36). Your local storage is ready to be added to the Red Hat Enterprise Virtualization environment. Storage local to your host has been prepared. Now use the Manager to add it to the host. Click the Hosts resource tab, and select a host in the results list. 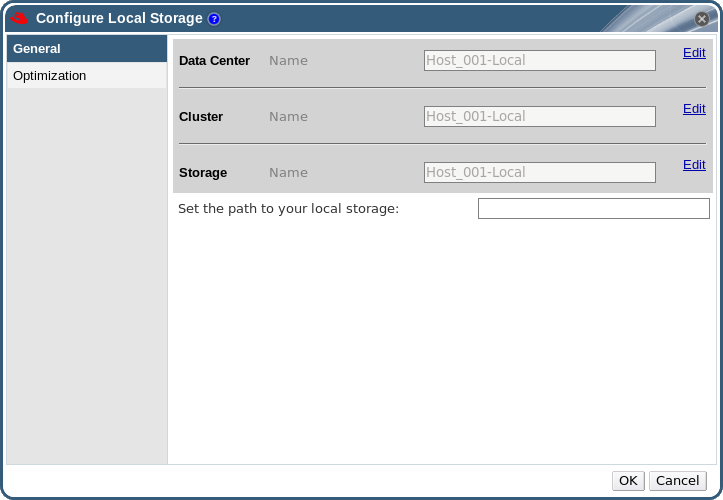 Click Configure Local Storage to open the Configure Local Storage window. If applicable, select the Optimization tab to configure the memory optimization policy for the new local storage cluster.